CBS’s “Face the Nation”: Sen. Tim Scott (R-SC); NAACP president Cornell William Brooks; Charleston Mayor Joseph Riley; Sherrilyn Ifill, NAACP Legal Defense and Educational Fund; Mary Ellen O’Toole, former FBI profiler and author of “Dangerous Instincts”; Rep. Devin Nunes (R-CA), Intelligence Committee chairman; Hugh Hewitt of “The Hugh Hewitt Show” and author of “The Queen: The Epic Ambition of Hillary and the Coming of a Second Clinton Era”; Gwen Ifill of Washington Week and PBS NewsHour; David Ignatius of The Washington Post; and Michael Gerson of The Washington Post. Fox News Sunday”: Former Gov. Rick Perry (R-TX), Republican presidential candidate; Cardinal Donald Wuerl, Archbishop of Washington; Laura Slover, CEO of The Partnership for Assessment of Readiness for College and Careers (PARCC); Karl Rove, former Bush White House Advisor and Fox News contributor; Rep. Donna Edwards (D-MD); Kathleen Parker of The Washington Post; and Deneen Borelli, author and FNC contributor. NBC’s “Meet the Press“: Rep. James Clyburn (D-SC); former Gov. Mike Huckabee (R-AR), Republican presidential candidate; David Brooks, columnist for The New York Times; Helene Cooper, Pentagon correspondent for The New York Times; Eugene Robertson, columnist for The Washington Post; and Gerald Seib, Washington Bureau Chief for The Wall Street Journal. 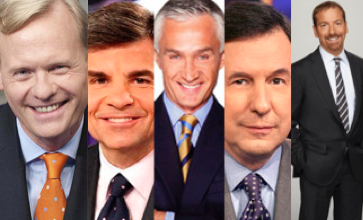 Univision’s “Al Punto” : Ben Carson, retired neurosurgeon and Republican presidential candidate; Lincoln Diaz-Balart, former U.S. representative and Republican political analyst for Univision News; Fabian Núñez, Democrat political analyst, former speaker of the California State Assembly; Arturo Vargas, executive director of the National Association of Latino Elected and Appointed Officials (NALEO); José Luis Montenegro, author of “Narcojuniors”; and Juan Felipe Herrera, U.S. poet laureate. CNN’s “Fareed Zakaria GPS” : Richard Clarke, former National Coordinator for Security, Infrastructure Protection, and Counter-terrorism (George H.W. Bush and George W. Bush Administrations); Jack Lew, U.S. Treasury Secretary (Barack Obama Administration); Leroy Chiao, PhD, former NASA astronaut; and filmmaker, Abigail Disney. CNN’s “Inside Politics”: Dan Balz, political reporter for The Washington Post; Nia-Malika Henderson, senior political reporter for CNN; Lisa Lerer, National politics reporter for the Associated Press; and Ed O’Keefe, political reporter for The Washington Post. CNN’s “Reliable Sources” : Bill Carter, contributor for CNN; and Frank Sesno, director of the School of Media and Public Affairs at the George Washington University. FOX News’ “MediaBuzz” : Mercedes Schlapp, former George W. Bush spokesperson; Joe Trippi, Fox News contributor; David Zurawik, Baltimore Sun media critic; Sen. Ted Cruz (R-TX), GOP presidential candidate; A.B. Stoddard of The Hill; and Lola Ogunnaike, Arise TV anchor. FOX News’ “Sunday Morning Futures” : Rudy Giuliani, former New York City Mayor (R); Larry Sabato, director of the Center for Politics at the University of Virginia; John Thiel, head of Merrill Lynch Wealth Management; Dr. Craig Venter, founder, chairman and CEO of the J. Craig Venter Institute; Ed Rollins, former principal White House advisor to President Reagan in both his terms and Fox News political analyst; Judith Miller, adjunct fellow at The Manhattan Institute for Policy Research, author, journalist and Fox News contributor; and Steve Moore, chief economist at The Heritage Foundation, Wall Street Journal contributor and Fox News contributor. PBS’s “Washington Week” : Carrie Johnson of NPR; Charles Babington of the AP; Yochi Dreazen of Foreign Policy Magazine; and Dan Balz of The Washington Post. We’ll update ‘em as we get ‘em (email fishbowldamon@gmail.com).